A few fave running items as of late. Check 'em out! The new compression fabric of these tights is heaven. 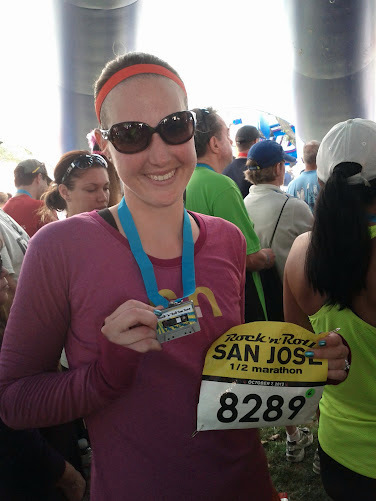 I wore them for the Detroit half, high 30s at the start and maybe low 50s at the end. No movement, no slipping, no chafing, and just the right length. The drawstring is nice and flat, so it's easy to tie and hide. There is a zip pocket on the back right side. They were perfect and oh-so-comfy. Mine are not the exact ones in the link (they are a knock off from Sports Basement), but I'm loving the snug but not too tight fit of the elastic. It adjusts to my feet, stays tight where I need it, and makes my shoes fit even better. Not to mention the easy on and off that comes with it! Newly elastic laced up shoes. 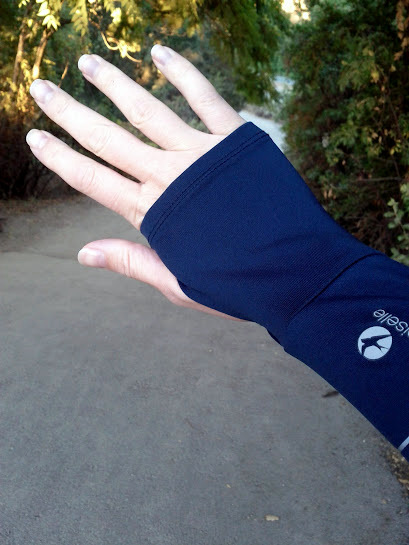 Arm warmers, the perfect in-between item to make a short sleeve shirt temporarily long sleeve. They are easy to pull down when you warm up and tiny to store in your pocket, so no need to tie a jacket or LS shirt around your waist. I even love them with tanks for added warmth on the arms; I was skeptical at first but it really works. These even have thumbholes for hand warmth! I finally replaced my old sunglasses with these and I couldn't be happier. The frame is a good size, has a no-slip surface on the nose and ear areas, and is easy to pop up on your head when it gets cloudy. 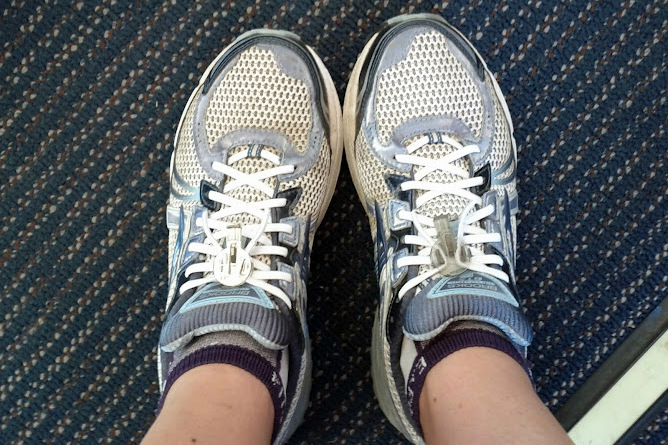 I've run with them comfortably on my face and my head many times depending on how the weather shapes up. Belts have never been my thing; who wants something on their waist when they are running? Or so I thought until I found this little gem. 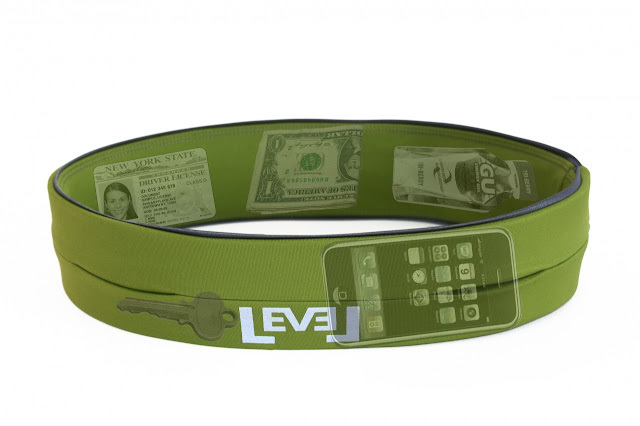 The Flipbelt is made of wicking spandex fabric, so it feels like clothing and not like a belt at all. You can slip items into the belt through little openings, flip the belt over so the openings are against your waist, and nothing falls out. I won't say it doesn't ride up at all, but for me it rides up just a little from my hips and settles into a good spot where it doesn't move. I've been doing long runs and races with this lately and I'm impressed. It took me a while to try out compression socks, but now that I did I'm loving this brand. The compression is just right, tight but not uncomfortable at all. I generally use them post-run for recovery, but I've run in them a few times. Oh, and they make perfect boot socks if you want hidden compression at work. Chillin' in ProCompression, complete with cat. That's it for now. What are you loving lately? I think you listed all of the things on my current want list! I love the Pro socks too, they are very comfy, I wish I could get away with wearing them at work. I'm lucky to have casual dress at work, although I do hide them under boots a lot! 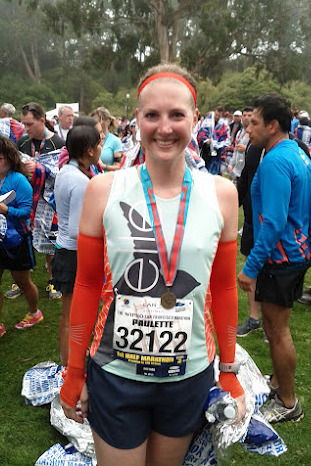 I loooove my Oiselle arm warmers and I've been looking to invest in the full-length Oiselle tights! My adidas clima-fit hat! Before I cut my hair, I never thought I would like running in a hat, but now, I find I can't go without one. It keeps those pieces still not quite long enough to tuck behind my ears, out of my face. PS-- I need one a pair of those sunglasses! LOVE. Ooo good to know! I don't currently have any hats! I love those socks. I live in them. lol. And you have inspired me to check out flipbelt. I have been having issues with my spi-belt lately and not likely it so much. I really like the flipbelt! Only one I've managed to wear. I like them for the auto adjustment that elastic makes - no more being too tight in one spot. Worth a shot! I worried they'd feel too tight all the time, but they haven't.